An unlikely pro-animal rights film! Reese Witherspoon is a cute, but deceptively determined pink-obsessed blonde, out to end cosmetic testing on animals. Directed by Charles Herman-Wurmfeld, the film has a great charm and humour, and the seriousness of the issue isn't lost because of it. 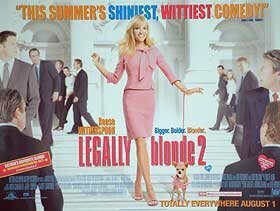 Bruiser the Chihuahua comes in handy as a tool for Ms. Witherspoon to melt the hearts of hardened senators. Sally Field is a surprising success as a hard schemer, though she melts in the end, and Bruce McGill is hilarious as the Alabama senator Stanford Marks, whose dog has a gay fling with Bruiser! Author: Based on characters created by Amanda Brown. Story by Natalie Standiford.